While members of boy band 2AM have slowly expanded on the realm of music they do, away from their group -- Jo Kwon sung a duet with Brown Eyed Girls member Ga-in (Son Ga-in) on MBC's make-believe reality show "We Got Married" and Lee Changmin formed a project duo named Homme with 8eight's Lee Hyeon -- Im Im Seulong's choice was to take on acting which he "had high aspirations for since becoming a celebrity". And within time span of less than a year, he has quite quickly taken on three roles starting with MBC TV series "Personal Taste" where he plays Tae-hoon who clings onto the woman he has a crush on, then "Best Theatre - Lunch Box" an MBC Sunday drama series whose title is translates into 'lunchbox', and movie "Acoustic". Of them, he has played the leading role in two and through his big screen debut pic "Acoustic", he even got to walk the red carpet of the 15th Pusan International Film Festival (PIFF) which he says "instilled within me the mindset that I'm an actor, an identity I have yet to establish". Being in the spotlight, something that actors who take on the lead roles usually experience, at such an early stage could plant an excessive amount of confidence within an actor who has just started his career. "After "Personal Taste" I wanted to stand in front of the camera some more as an actor rather than take on an important role. I don't want to step into waters too deep for me to handle yet". And so he successfully avoided from becoming conceited by taking on an hour- long one-act play and a music film which "contained a refreshing and interesting script about 'what music and sound will be mainstream in the future', - a thought he had usually thought about. Like the Tae-hoon from "Personal Taste" who could not handle the xxxx emotions he has for the woman he likes, Im Im Seulong himself failed to become Tae-hoon, admitting he cringes when he thinks back on the role. And while the newbie station employee Soo-chul he played in "Lunchbox" was similar to Tae-hoon in that they were both honest and cheerful, Im was a completely different man from the previous six months. He unabashedly portrayed the slightly 'loser-like' Soo-chul by failing to catch the direct sign the woman lying down next to him send him by saying, "It's hot" by grumbling to himself. "I did a lot of preparing on a personal level. For the scene where Soo-chul talks to himself for three minutes in particular, I had to speak the whole time so I fixed the ending to some of the words to make them sound more natural when I say them". And that may be why but the members of his group 2AM who "simply showed a lot of support for it being the first time" when Im was in "Personal Taste", monitored his acting in more detail starting with "Best Theatre - Lunch Box". Even though Im had to have his hair blow dried after every scene because, as he explained he "sweats a lot and many of the scenes were shot outdoors in mid-August", the reason he was able to say, "Everything was good except for the fact that it was hot" is because it was where he could learn much as a newcomer actor. "Ah, that's what you thought of it. Wow, thank you". This is how Im started his response when asked a question after being told an opinion about his film or acting. And he could have talked about how he interpreted and expressed Soo-chul in a grandiose way, yet he paused for a moment and said instead, "I thought a lot about how Soo-chul would express the great saying, 'Life may not be as good as you expected it to be but is better than what you worried it might have been'". Of course, he also desires to "do masculine acting in noir films like 'The Godfather' or 'A Bittersweet Life'" and he is "in dilemma over being a member of 2AM which is active in variety shows while most actors maintain a certain image even when they go on such shows". But for now, it is okay for him to enjoy feeling curious over the fact that he feels "amazed at how my acting and singing are improving together" rather than desire or worry over the future. Because like he said, he is "a new actor who has taken the first step". 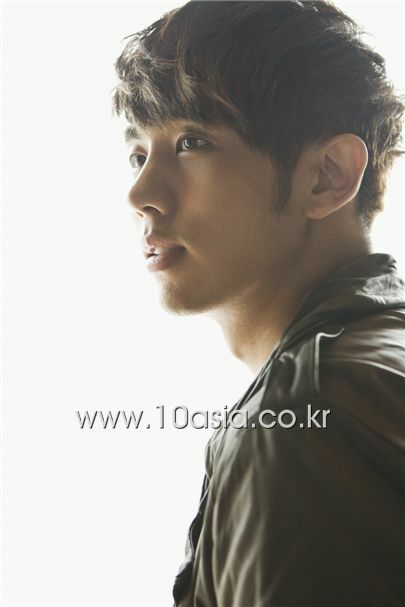 Singer and actor Im Im Seulong poses during an interview with 10Asia.